Zak Smith isn’t the only kid on the block with a new 6.5×47 Lapua tactical rifle. Our 1K editor, Jason Baney, has built his own 6.5×47 tactical rig. It has a trued Rem 700 action, Krieger 8.5 twist 25″ barrel, AI CS detachable box magazine (DBM), Badger bottom metal, and a custom U.S. Optics 3.8-22×44 SN3 scope with a EREK elevation turret, MDMOA reticle, and left-handed windage knob. Even with limited load-testing time, Jason quickly found a tack-driving 2960 fps load with Lapua Scenar 123s and Reloader 15. In the weeks ahead, when he’s not involved in Williamsport 1000-yard BR matches, Jason will be working up loads for this rifle, and a new 6mm/6.5mmx47 switch-barrel project gun AccurateShooter.com is developing. His next experiment is to try H4350 with the Berger 130s in the 6.5×47 Lapua. Reloader 15 shot bugholes with the 130s, but Jason felt that ambient temps affected his velocities too much. Here’s a “glamour shot” of Jason’s 6.5×47 rifle in McMillan A5 stock, smithed by GA Precision. Click for BIG PHOTO. Share the post "Jason Slams Steel with 6.5×47 at ASC"
SWFA.com has a great deal running right now on Leupold scopes and other optics. Purchase a Leupold optic from SWFA and you’ll receive FREE shipping plus a selection of free Leupold shooting accessories. The extra gear you get depends on the item purchased and the sales price, as explained in the graphic below. Click HERE for a larger version of the promo flyer. For more info, call SWFA at (972) 726-7348. 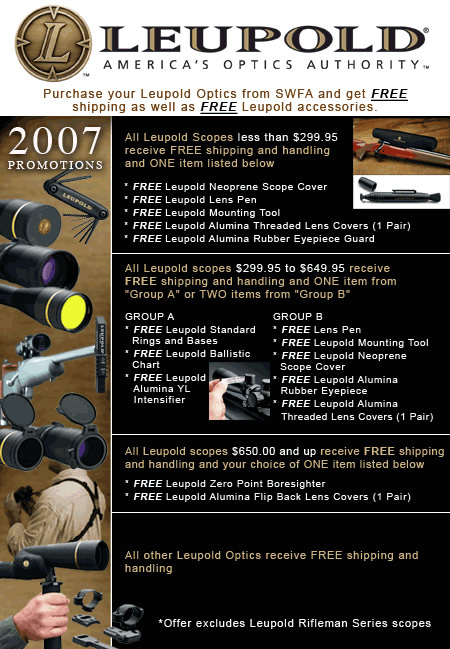 Share the post "Free Accessories and Free Shipping with Leupold Optics"